The Indoor Cycle NXT combines user-focused features with a high degree of adjustability to deliver best-in-class performance for riders of all shapes, sizes and abilities. 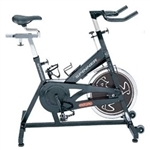 To maintain uncompromising quality ride after ride, the Indoor Cycle NXT features an extra durable crank system, rust-defying materials and rock solid construction. Combine the Indoor Cycling program and the Indoor Cycle NXT with Star Trac’s unsurpassed customer service, support and training, and you’ll have all the tools necessary to kick your facility into high gear. Expanding the Indoor Cycling experience beyond the studio and onto the cardio floor. Welcome to the Indoor Cycling system! Whether you want to lose weight, gain energy or are simply looking for a workout that's as fun as it is effective, the Indoor Cycling system can help you get into the best shape of your life.